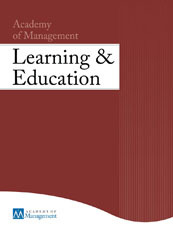 Issue on: Rationality, Management Learning and Education: Reconceiving and Reinvigorating the Role of Reason in Managerial Practice. As space is limited, preference will be given to participants who are presenting working papers that demonstrate good fit with the Special Issue theme and which show potential for development. Those who wish to have their paper reviewed and discussed should submit an extended abstract (between 5 and 10 pages of text) by Friday, February 15, 2019. Please note that participation at the workshop does not guarantee the inclusion of the paper in the Special Issue.